Hinata is the eldest child of the HyÅ«ga clan's leader, Hiashi HyÅ«ga. As a child, Hinata was regularly seen as being rather shy. 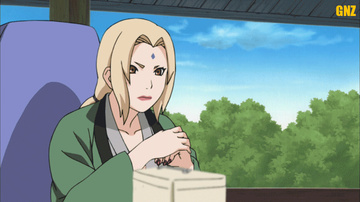 As the eldest child, it was her birthright to become the next heir to the HyÅ«ga clan's main house. She was regularly put through gruelling training by her father. One night, while still a child, she was kidnapped by a head ninja from the Land of Lightning. Her father killed the head ninja to save her, which ultimately resulted in the death of Hinata's uncle, Hizashi HyÅ«ga. Despite the sacrifice that went into saving her, Hinata's father eventually deemed her a lost cause that was weaker than her sister, Hanabi HyÅ«ga. When she was assigned to Kurenai YÅ«hi, he told her that he was unconcerned that she might die on a mission, saying that he had no use for a weak heir, and began concentrating on Hanabi. Hiashi then left Hinata in Kurenai's care.